An international team of astrophysicists have reported the successful imaging of Icarus, a single star whose properties suggest that it is located approximately 9 billion light years away from Earth. This new finding indicates that Icarus is possibly the remotest body in the universe, that humans have detected till date. Working across a range of institutions in the UK, Spain, Denmark, Japan and the US, scientists used the gravitational-lens technique to image the star, which they initially termed MACS J1149 Lensed Star 1 (LS1). However, it also acquired the name of Icarus. Gravitational lenses, which are partially conferred by other galactic clusters in the vicinity of the object, can magnify other galaxies. With these devices, the cosmos can be detected by telescopes on Earth despite being billions of light years away. This is how Icarus, which is now considered the most remote body relative to us, was magnified thousands of times over by the lens. The clear images seen of this star are sheer "good luck", in astronomical terms! The team of scientists, led by Patrick L. Kelly of the University of California's (Berkeley) Department of Astronomy, reported that Icarus happened to have a fortuitous placement relative to the gravitational lens. As a result, the star was able to avoid the detrimental effects of the caustic curve, which is a 'nexus' of bodies with improved levels of magnification in the source plane of the lens. Therefore, bodies that are sufficiently far away (ten parsecs or more) from the galactic cluster (MACS J1149, in this case) can only be magnified by a factor of 50. Icarus was near enough to MACS J1149's caustic curve to be magnified at least 2000 times. The latest images of Icarus were taken nearly two years ago (in late April to May 2016) using the Hubble Space Telescope (HST) Wide Field Camera 3 infrared (IR) camera. The imaging session was, in fact, intended to assess the explosion of the Refsdal supernova. However, the team also noticed an anomaly in the red-shift of MACS J1149. It was found to be a single source of blue light coming from an individual super-giant - MACS J1149-LS1. LS1 appeared to be sitting alone on the outer edge of the main MACS J1149 cluster. A subsequent review of images of the Refsdal area, taken in 2014, also showed somewhat dimmer signs of LS1 in the same position. From these images, the team observed that LS1 appeared to be right on the edge of the MACS J1149 lens' critical curve, an ideal spot for imaging at greater magnification. Higher-resolution imaging, in May 2016, imaged the LS1 at about 4 times the brightness as compared to in 2014. The spectral energy distribution (SED) of LS1 was found to be consistent, although its light curve was found to be variable. The team then concluded that this giant's properties were in accordance with one being lensed by the nearby galaxy and whose brightness varied with magnification. Icarus: Single Star or Binary System? LS1 was also found to have a temperature of 11,000 to 14,000 kelvin and a characteristic SED profile. These properties were also consistent with MACS J1149’s red-shift (z=1.49). LS1 was also found to be relatively small (0.06 parsecs in width) suggesting that it was most likely a single star or a binary system, at best. The team also detected signs of a second body, which seemed to be extremely close to LS1. The images of this object, termed Lev16B, were found to have nearly identical properties in terms of colour and colour-magnitude. On the other hand, Lev16B was offset from LS1 by 0.26". This detail was not discovered until October 2016 due to the reduced ability for magnification. The team concluded that Lev16B was most likely a counter-image of LS1. But, it was possible that it could be a 'twin' to the initial lensed star in a binary system. If so, as the scientists believed, Lev16B was just that little bit further away from the critical curve of the MACS J1149 lens. This was the reason for inferior magnification compared to that of LS1. LS1, known as Icarus, is a single (or possibly binary) blue super-giant located on the outer edges of the MACS J1149 galactic cluster. Were it not for this cluster, which is 5 billion light years away from Earth, we would not even know that LS1 was out there! A team of scientists from astronomy centers around the world have captured and assessed highly magnified images of Icarus using the HST. They concluded that it is a body that is a further 4 billion light years away from Earth. This statistic makes Icarus the most remote body (we currently know about) in the universe. 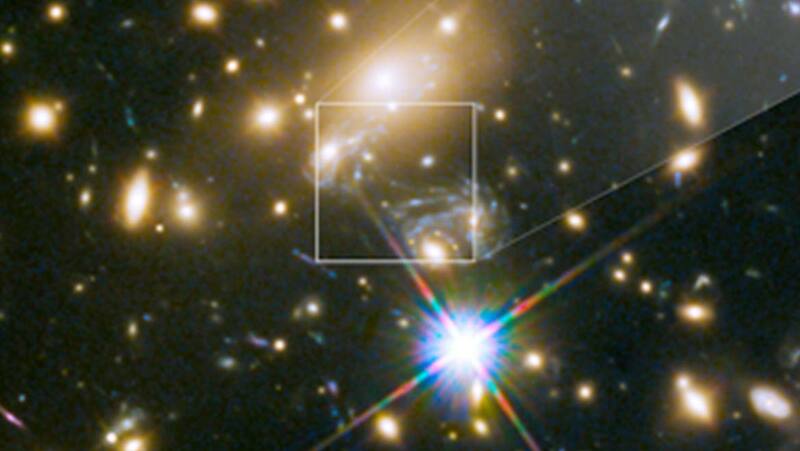 The team now plan to apply the gravitational lens technique to other objects in the vicinity of MACS J1149, including its giant array of black holes. In the meantime, studies are being conducted in other pursuits, the Webb telescope, for example, to image cosmic bodies in the farthest reaches of space. Kelly PL, Diego JM, Rodney S, Kaiser N, Broadhurst T, Zitrin A, et al. Extreme magnification of an individual star at redshift 1.5 by a galaxy-cluster lens. Nature Astronomy. 2018;2(4):334-42. Jauzac M, Richard J, Limousin M, Knowles K, Mahler G, Smith GP, et al. Hubble Frontier Fields: predictions for the return of SN Refsdal with the MUSE and GMOS spectrographs. Monthly Notices of the Royal Astronomical Society. 2016;457(2):2029-42.